This tiny custom-made prefab weekender reinvents the coastal cottage as a sleek, Scandi-style floating box, cutting budgets and environmental impact while delivering on design. Fisherhaven's calm lagoon, indigenous-plant-covered dunes and beautiful mountain backdrop remain, if not undiscovered, largely undisturbed. This in spite of being on a strip of Western Cape coastline known for its popular beaches, glamorous golf courses and imposing seaside mansions. By and large, the town's architecture tends towards the conservative. Show-off villas don't really feature. One of the reasons might be the prohibitive cost of getting building materials there and of finding the skills to build anything ambitious. 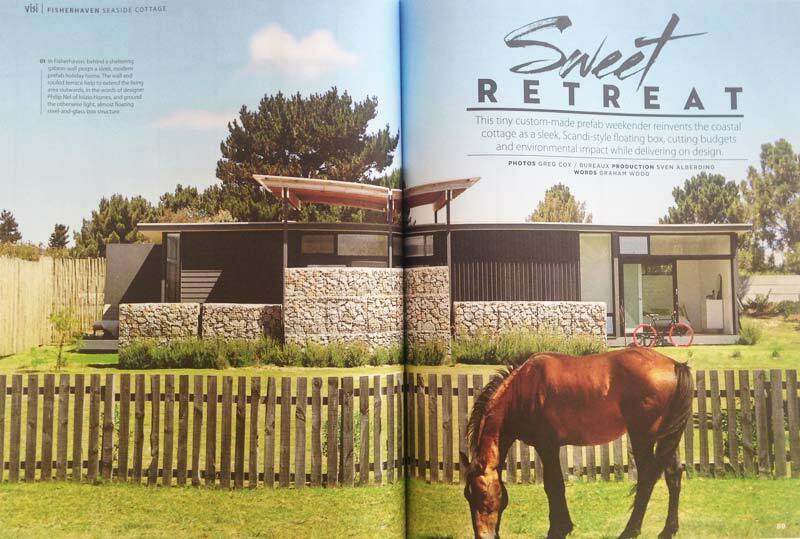 Clients of industrial designer Philip Nel of Inizio Homes found Fisherhaven's off-the-beaten track appeal perfect for the kind of prefabricated construction he has pioneered. Originally specialising in furniture, Philip branched out into custom-prefab home design while investigating building his own house. That was in 2008, and he's been refining his designs and approach ever since. Through Inizio Homes, Philip now offers his clients a complete turnkey service from architectural design to construction. Prefabricated construction is perfect for remote spots like Fisherhaven because most of the components are manufactured in a factory and delivered to the site ready to assemble. The construction process is quick and clean, and has far less impact on the environment than conventional building. Philip has also developed a precast concrete foundation system that guarantees the strenth of the home's base. Between the lightness of the structure(about 10% of the weight of bricks and mortar) and the foundation, the prefab construction method is particularly well suited to tricky conditions, for example, where soil quality is poor. It also means it's possible to push the envelope design-wise without blowing the budget. “Most of the places we do are custom designed”, says Philip. In many ways, Philip's design took its inspiration from Scandinavian summer homes known for their simplicity, but also for their warmth and stripped-down comfort. The main section of the house is a modern box with double-glazed doors and windows to let in the light, and views to the north. It is clad in low-maintenance fibre cement sheeting and profiled Chromadek sheeting, which is traditionally used for roofing. “As a holiday house, it had to be low-maintenance”, says Philip. 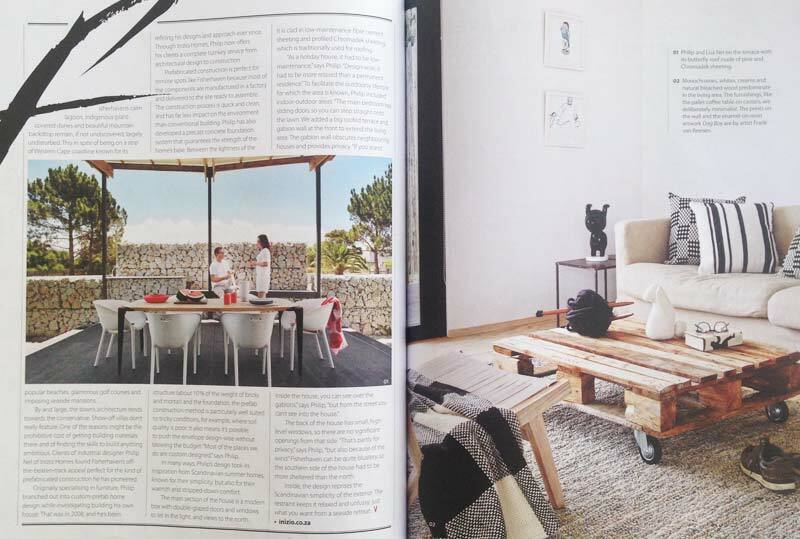 “Design-wise, it had to be more relaxed than a permanent residence”. To facilitate the outdoorsy lifestyle for which the area is known, Philip included indoor-outdoor areas. “The main bedroom has sliding doors so you can step straight onto the lawn. We added a big roofed terrace and gabion wall at the front to extend the living area. The gabion wall obscures neighbouring houses and provides privacy. “If you stand inside the house, you can see over the gabions”, says Philip, “but from the street you can't see into the house”. The back of the house has small, high-level windows, so there are no significant openings from that side. “That's partly for privacy”, says Philip, “but also because of the wind.” Fisherhaven can be quite blustery, so the southern side of the house had to be more sheltered than the north. 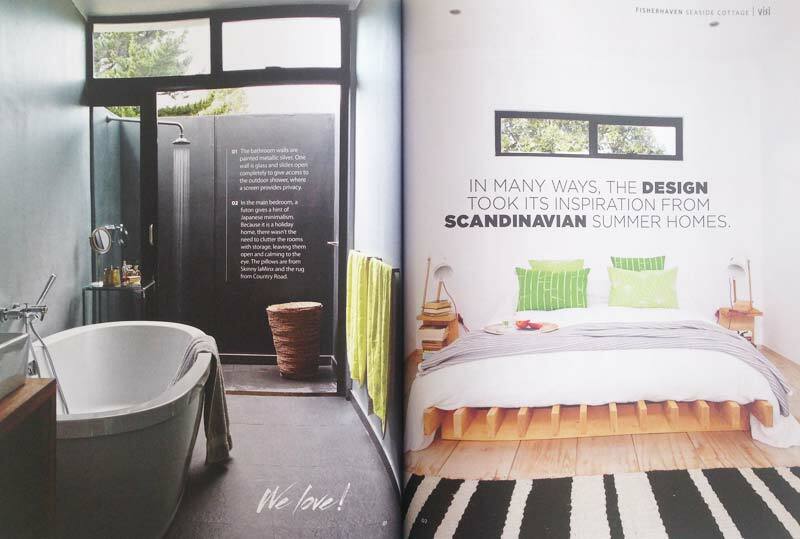 Inside, the design reprises the Scandinavian simplicity of the exterior. 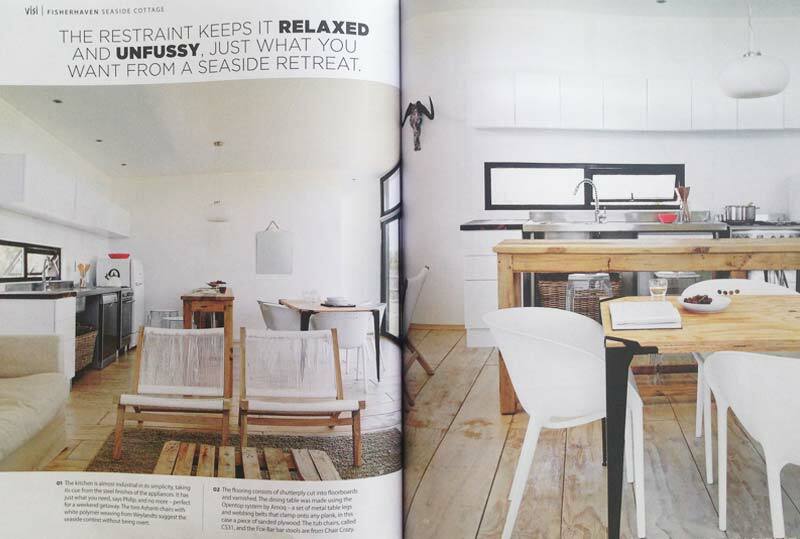 The restraint keeps it relaxed and unfussy, just what you want from a seaside retreat.